…that dream of a land in which life should be better and richer and fuller for everyone, with opportunity for each according to ability or achievement. It is a difficult dream for the European upper classes to interpret adequately, and too many of us ourselves have grown weary and mistrustful of it. It is not a dream of motor cars and high wages merely, but a dream of social order in which each man and each woman shall be able to attain to the fullest stature of which they are innately capable, and be recognized by others for what they are, regardless of the fortuitous circumstances of birth or position. A dream that anyone can realize their full potential. Where it doesn’t matter if you are born poor or rich, you can achieve your goals. Even though I was born into a lower middle class family, I was able to achieve my goals. Unfortunately, I’m not sure the same opportunity exists today. In 1980, I began attending the University of California, Los Angeles (UCLA). That same year, I also got a job as a grocery store cashier. From the 1980-81 UCLA catalog, total estimated expenses for that year were $1,713 for someone living at home – as I was. Considering that my starting pay was $7.50/hr, and I averaged a little over 20 hours per week, I could cover all of my annual education expenses with about 3 months of work. Stagnant entry-level wages – Had incomes for grocery clerks kept up with inflation, the starting wage today would be $20.15 – not $7.97. Declining public funding – In 1980, total public funding (state and federal) for California higher eduction was $4.9B out of a total of $34.5B – 14.3%. Last year, it was only $15.3B out of $213B – 7.2%. But this problem isn’t unique to California. Nationwide, the result of lagging entry-level wages and rising education costs have resulted in an explosion of student debt. The latest data from the 2010 Survey of Consumer Finances show that average inflation-adjusted debt has tripled since 1989. So much for being able to work your way through college … or being able to save enough to pay for it. Most people don’t realize that California’s higher education is still cheaper than the rest of the nation, but it is not cheap by far. I went to college about ten years before you and was shocked when I had to pay $100 per semester for books (now $100 per book is not unusual). And this is far ahead of inflation. Basic economics states that to find an item’s price point, raise prices until demand falls to meet supply. Are we there yet? It’s even better when the professor makes you buy his own book for the course – he gets you coming and going. I attended “that other University in LA” not long after you arrived at UCLA and can tell you that I observed very much the same as you. It wasn’t impossible for my friends across town to more or less work their way through school with run-of-the-mill summer jobs. You couldn’t do that today, not by a long shot. Is the education that much better. Heck no. Probably substantially worse relative to what people actually need to know in order to succeed (read: survive) today. Michael, what point are you trying to make??? Are you for a free market or not? Are you for where employers determine the pay scale or not? Did someone hold a gun to folks head and make them take the job at a pay scale lower than in your mind is not appropriate? WTH point are you trying to make? From a true conservatives standpoint it looks to me like you are all for big Fed gov controlling everything. Is that what is written in our constitution? No it is not, but you obviously have a problem with that issue. What is it with all you that went to college in CA that makes you believe our constitution is irrelevant? You are outstanding at copy/paste of liberal talking points, but can you do free handed debate on a topic without spending a month copy/pasting liberal talking points? I seriously doubt it. The one thing you leftist have in common is zero original idea, but simply doing exactly what the progressive think tank tells you what you to write. You’re no better than Bendick Arnold. See you on another blog, if you think your good enough to think for yourself and back you ideology up! The point I’m trying to make is that opportunities that existed 30 years ago don’t exist any more. Not only has pay at the lower end not kept up with productivity, in many cases it hasn’t even kept up with inflation. I see no reason why the productivity gains of the last 30 years should only be going to corporate profits and executive compensation. Before 1980, that wasn’t true. In the 50s, 60s and 70s, everyone benefited from rising productivity. 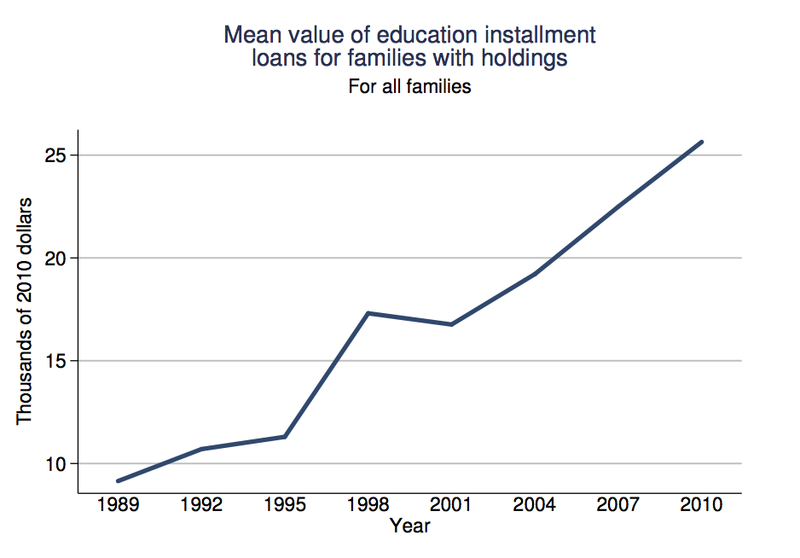 That’s why the middle class had it better then – most families had stay-at-home moms and little household debt. Yes, I believe in an intelligently regulated free market – but I don’t believe in one-sided robber-baron capitalism. That type of economy is unsustainable and usually ends badly. The last two times the US experienced high income inequality and low union membership were the 1920s and 2000s. Both periods ended in severe economic downturns – mostly as a result of low worker pay and high household debt, IMO. No, I don’t think employers should get to dictate pay – it should be a negotiation between employer and employee. And the only way most workers can negotiate on a reasonably level playing field is if they bargain collectively. I also think we should do what Germany does and insist that labor get a seat on the board. Finally, I don’t believe in “big government”. As one example, I oppose Obamacare. We need major healthcare reform, but not a big, complicated government program.